"A good horse trainer can get a horse to do what he wants him to do. A great horse trainer can get a horse to want to do it" - Monty Roberts. Monty Roberts has spent a lifetime studying, watching and working with horses of all kinds both in the wild and also in domestic surroundings. The concept of choice is at the heart of Monty's training system. His methods are non-violent and do not rely on pain, or restraint; the horse is never forced to do anything. Monty's training methods are all based on an understanding of the nature of the horse. His ideas work because they are rooted in the horse's natural instincts. Having an understanding of the horse's psychology which is very different to that of a human, is crucial when trying to successfully communicate and work with horses. All horses and ponies are individuals. They have different personalities, abilities and levels of sensitivity much like humans do, but they only have 2 goals in life: one is to survive and the other is to reproduce. It is because of these 2 goals that a language exists. 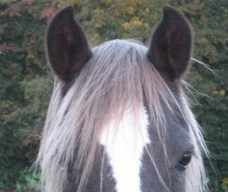 Monty describes the horses' language as 'The Language Equus'. It is a silent language that is based almost entirely on body language; a language of gestures. Monty found through his years of work with horses,a way of interpreting the horses' body language and how to use his body to reply. He also found that not only was their language highly effective but it was also predictable and discernible. I can remember one particular holiday abroad when I ended up travelling through a country where I didn't speak the language. I can honestly say that it was one of the most frustrating experiences of my life. I was in my early twenties, alone, lost and unable to communicate verbally with anyone. I felt feelings of panic and frustration and amongst many tears I just kept hopefully asking strangers "excuse me, but do you speak English?" Eventually a lady answered me with " yes, a little bit." The sense of relief that I then experienced, was really quite amazing. It didn't matter that it was only 'a little bit'! I was just so relieved to have some communication and be understood. Filled with hope, we continued most of the conversation with fragments of English, interspersed with many gestures of body language, and I successfully found my way again. I always look to this experience when I try and imagine what it must feel like for a horse who is being misunderstood, and I can sympathise with the owner who generally is suffering extreme frustration! Watching both horse and owner begin to relax and communicate successfully with one another as their first session progresses, is truly rewarding. I truly believe that our first responsibility as horse owners should be to learn the language of the horse, and work at observing their gestures, as only through learning to communicate in their language can we then effectively deal with their individual needs. An important point to remember is that your body is communicating with your horse whether you realise it or not; each move or gesture you make, each flick of your eyes - be aware - your horse is watching you!!! !